will also double the amps for more power storage, which is why this is done in the first place. This method also means that your batteries will charge at the same rate. It is also important to use the same type of batteries, the accompanying video will explain about the different types of Leisure Batteries and the best for most applications are AGM batteries. 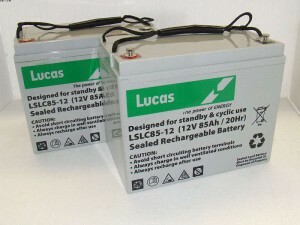 The Leisure Batteries that you connect together must also be the same type and age, preferably new batteries, it will be of no use if you connect a new battery with one that is old and has less power. this will only make the new battery fail at a later stage and not give you the full power that you are looking for. It is also possible to connect each battery to a fuse, which will stop the risk of a high current flowing from the good battery to the bad battery with a faulty cell causing it to short; this situation could be dangerous, with a risk of a fire or explosion.